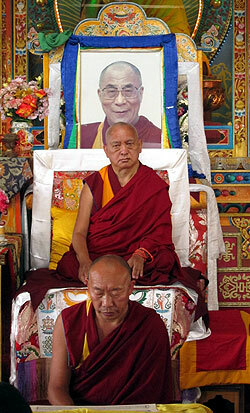 Lama Zopa Rinpoche at Kopan Monastery, Nepal, with the Lama Gyupa teacher, May 2012. Would You Like to Understand Dharma Teachings Directly? Rinpoche is now in the United States for a private visit to receive medical check-ups and follow up on some local projects. Khadro-la is also in the United States at Rinpoche’s invitation to check on a location for a stupa and to bless a mandala in Portland, Oregon. Lama Zopa Rinpoche listening to the debate at Kopan Monastery, Nepal, May 2012. FPMT has an enormous wealth of Rinpoche’s advice available to you 24/7! You can find Rinpoche’s advice arranged under the following topics: animals, Buddha multiplying days, centers and FPMT organization, death, holy objects, natural disasters, peace in the world, practice and practical advice, protection from harm, retreat, sickness and Shugden (Dholgyal) advice. Plus, Lama Yeshe Wisdom Archive has an extensive range of advice, including Lama Zopa Rinpoche’s Online Advice book, easily available and searchable by topic. If you have any questions for Rinpoche, such as what to do when someone is sick, or general advice for your Dharma practice, have a look at our Contact Lama Zopa Rinpoche page. Additionally, we invite you to enjoy the extensive and regularly updated Lama Zopa Rinpoche Photo Gallery. We are happy to make available for you, for free, the Amitayus Long Life Sutra, in eight languages including the recently added Chinese. A Drop of Aggregates, a treatise on how the aggregates are presented in Buddhist philosophy and how meditation upon them can help to loosen one’s grasping at them. A Drop from the Ocean of Consciousness, a compendium on awareness and knowers, primarily based on Collected Topics by Yongdzin Purchok Ngawang Jampa. The Sun Illuminating the Profound Meaning of Emptiness, a commentary on the Heart Sutra by Chone Lama Dragpa Shedrub. Mandala‘s July-September 2012 issue is on its way to mailboxes worldwide! 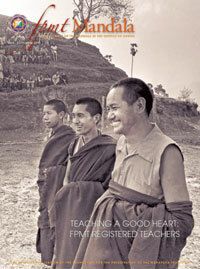 Our cover story, “Teaching a Good Heart: FPMT Registered Teachers,” looks at the importance of qualified teachers and the care that FPMT puts into its teacher registration process. We also share an excerpt from Lama Zopa Rinpoche’s new book Bodhisattva Attitude: How to Dedicate Your Life to Others, plus much more both in print and online. If you aren’t receiving Mandala and would like to, please consider joining our Friends program. 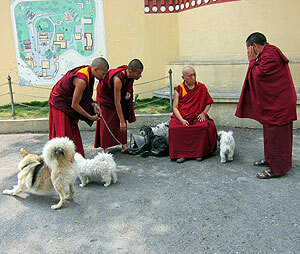 Lama Zopa Rinpoche blessing dogs at Kopan Monastery, Nepal, May 2012. A heartfelt thank you to and sincere REJOICING for the more than 500 participants in this year’s Work a Day for Rinpoche event. People have generously donated over US$66,500 so far this year. Thank you for your kindness, your dedication and your generosity. The success of this year’s Work a Day for Rinpoche demonstrates how Rinpoche’s message of compassion and wisdom continues to inspire the worldwide FPMT community. We know that making generous donations is only one of the many beneficial activities you do in support of Rinpoche’s wishes. Please rejoice with us for all these positive actions. For everything you are dedicating and offering to support Lama Zopa Rinpoche’s vast and compassionate vision, thank you so much. You can still participate in Work a Day for Rinpoche by visiting us online. 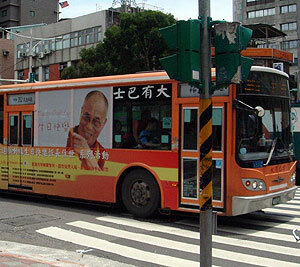 In June 2012, FPMT was able to send US$115,000 to Sera Je Monastery. This contribution covers the next six months’ worth of meals for all 2,600 monks currently studying at Sera Je. Thank you to all the kind benefactors who support this amazing project, especially Cham Tse Ling in Hong Kong and Amitabha Buddhist Centre in Singapore. Please rejoice in this incredible offering that we are able to make to the Sangha, our future center geshes and to His Holiness the Dalai Lama. Please enjoy this moving letter of appreciation from Kopan Monastery’s Geshe Thubten Jinpa, “Rejoice for the Wonderful Food Fund! A Devotional Tear Dropped in the Rice Bowl.” Geshe Jinpa is currently studying at Sera Je Monastery and he shared with us this spontaneous expression of his appreciation to the Sera Je Food Fund. We are happy to announce that the Sera Je Food Fund web page has been recently updated and revamped with this important project’s latest information, photos, videos, news and more! Geshe Jinpa from Kopan Monastery, with a strong desire to fulfill Rinpoche’s wishes and with his own strong personal conviction, went on a fearless adventure to save over 100 yaks from imminent slaughter. This extraordinary journey was captured in the 30-minute documentary 108 Yaks: A Journey of Love and Freedom, produced by Geshe Jinpa with the help of friends at Amitabha Buddhist Centre in Singapore. The DVD is available to order from the Foundation Store. For the full story, please read “A Journey for the Love of Animals” in Amitabha Buddhist Centre’s May-June 2012 issue of Tashi Delek. A reminder that the 10th FPMT International Sangha Day, celebrated on the occasion of the day marking the First Turning of the Wheel of Dharma, is on July 23. Please plan your events and your annual donation to the Lama Yeshe Sangha Fund soon. And if July 23 doesn’t work for your community, consider participating on another, more suitable date! Lama Yeshe, Yucca Valley, California, 1977. Photo by Carol Royce-Wilder, retouching by David Zinn. All FPMT centers, projects and services are requested to have a large picture of each of our main teachers in their gompa: His Holiness the Dalai Lama, Lama Yeshe and Lama Zopa Rinpoche. We have made it easy for you to have gorgeous pictures by providing high-resolution photos for printing in the FPMT Affiliates Area under “Further Resources.” These photos may also be used as valuable gifts to volunteers and benefactors. 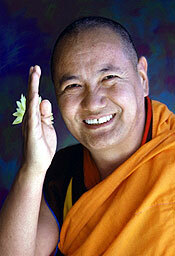 With thanks to the Lama Yeshe Wisdom Archive (LYWA) for the wonderful photos of Lama Yeshe! More pictures are available in the LYWA Online Image Gallery and individuals can order personal copies of portraits through LYWA. Get a 50% discount on the latest Lama Chöpa Jorchö Practice Book and Lama Chöpa Tunes and Audio Guide MP3. Make sure both items appear in your shopping cart to access this promotion. Ian Green, director of the Jade Buddha for Universal Peace, tells us that 5,600,000 people attended Jade Buddha events as the statue toured around the world between March 2009 and May 2012! The deadline for applications for LRZTP6, starting October 2012, is June 30, so don’t miss this rare and amazing opportunity to learn the Tibetan language, understand Tibetan teachers directly and become a qualified interpreter for Dharma teachings! Contact director Claire Barde for more information. There are many openings for spiritual program coordinators (SPCs) at the moment. Buddha House and Chenrezig Institute in Australia; O.Sel.Ling Centro de Retiros in Spain; and Vajrapani Institute in the United States are all looking to fill this important position. FPMT International Office has an opportunity for a suitable candidate to offer service as Director of Finance and Administration.